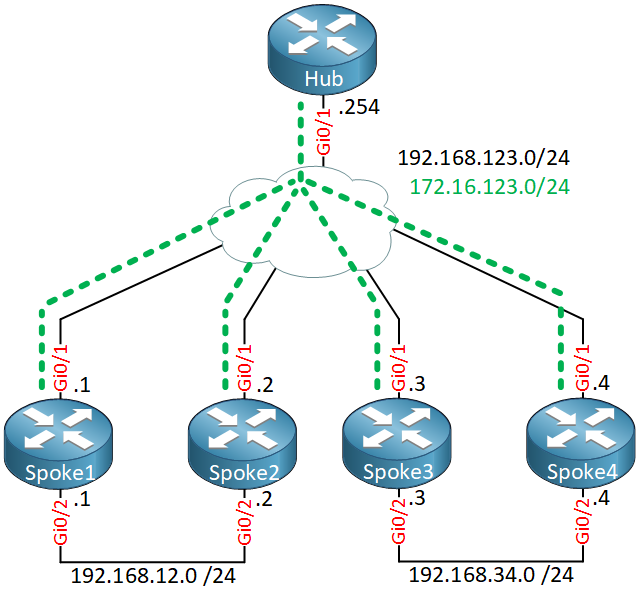 The EIGRP Add Path Support is a feature that allows the hub in a DMVPN topology to advertise multiple best paths to its spoke routers. This feature is needed if you have two or more spoke routers that advertise the same subnet. The hub router will learn about the subnet from both spoke routers so it can use ECMP (Equal Cost Multipath) with both spoke routers. EIGRP however, will only advertise one path to other spoke routers. Without this feature, you can’t use ECMP between spoke routers and when one of your spoke routers fail, EIGRP has to re-converge. The Add Path Support feature is best explained with an example. I’ll show you a “before” and “after” scenario so you can see the difference. EIGRP Add Path Support is only available in EIGRP named mode. Above we have a hub router and four spoke routers. These routers are connected to each other using their GigabitEthernet0/1 interfaces and the 192.168.123.0/24 subnet. The tunnel interfaces for DMVPN use the 172.16.123.0/24 subnet. Spoke1 and spoke2 are connected to the 192.168.12.0/24 subnet, spoke3 and spoke4 to the 192.168.34.0/24 subnet. This network is configured to use DMVPN phase 2 and EIGRP has been pre-configured to advertise the GigabitEthernet0/2 interfaces of the spoke routers. The spoke routers each have only a single entry. This is because the hub won’t advertise two routes for a single network. We have reachability, but it’s a shame that for example, spoke1 can only reach 192.168.34.0/24 by going through spoke3. It would be nice if it could also use spoke4. Also, if spoke3 fails, EIGRP has to re-converge. Hub(config-router-af-interface)#add-paths <1-4> "Number of add paths to be advertised"
Can you explain more about when we use the number of 1, 2, 3, or 4? Even though I tested with add-paths of 1-2-3-4, the result’s nothing change. The add-paths is used when you have multiple paths from the hub to a specific network that can be reached via multiple spokes. EIGRP however advertises only one path as the best path to connected spokes. The add-paths command allows EIGRP to advertise up to an additional four. This will only be seen if multiple paths are present to the same network.